For over twenty years Miguel has been playing electric and flamenco guitar; composing and producing music; performing and recording with different kinds of bands and genres - Pop Rock, Flamenco, Chill out, Latin Jazz - and doing session work both live and in studio for several artists. 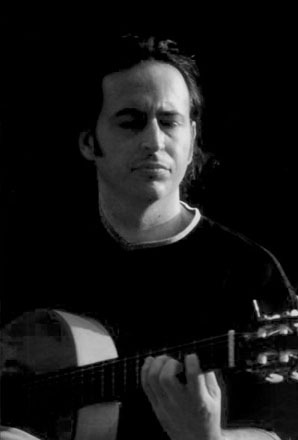 Miguel Moreno collaborations includes recording flamenco guitar for the film score “dos destinos”, he also recorded guitars for Dannii Minogue, Steve Miller from Afterlife, Chill out bands... read more. Miguel Moreno's music production compositions are used frequently in programmes, series and documentaries worldwide, broadcast by major TV channels... read more. Miguel licenses his music through various publishing companies, some of which are listed in the Production Music section. “I love writing soundtracks and mixing electronic and acoustic instruments to find the right balance of sounds and moods."